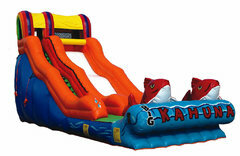 20ft Big Kahuna Water Slide is a HUGE slide. Climb to the top, slide down and about half way down the slide, there is a dip and then slide into a splash pool of water. Great for the bigger kids and adults up to 250lbs. Take a look at our videos of the Big Kahuna Slide and you can tell this is not your average little slide. The bigger kids love this slide as do the smaller kids. Oh don’t forget about the adults. They also take a few trips down the slide and the kids get a great laugh. If going through a gate, must have at least 48 inches of clearance to fit (Please measure before you book). WE CANNOT SET THIS SLIDE ON CONCRETE OR PAYMENT…MUST BE SET UP IN GRASS.